It's time for the FIFA World Cup semifinals, and the much anticipated game between Germany and host Brazil kicks off Tuesday. FIFA has chosen Mexican referee Marco Rodriguez to officiate the game. If that name rings a bell, it's likely because you saw or heard how he missed Uruguay's Luis Suarez bite Italy's Giorgio Chinellini during the Group D match in June. Suarez may not have been penalized during the game, but he has since been banned for four months by FIFA. Let's hope Rodriguez doesn't miss any other huge incidents like a player biting another player. Then again, it's not like Suarez is playing on Tuesday, right? This will be the third and largest game for Rodriguez in these World Cup games. 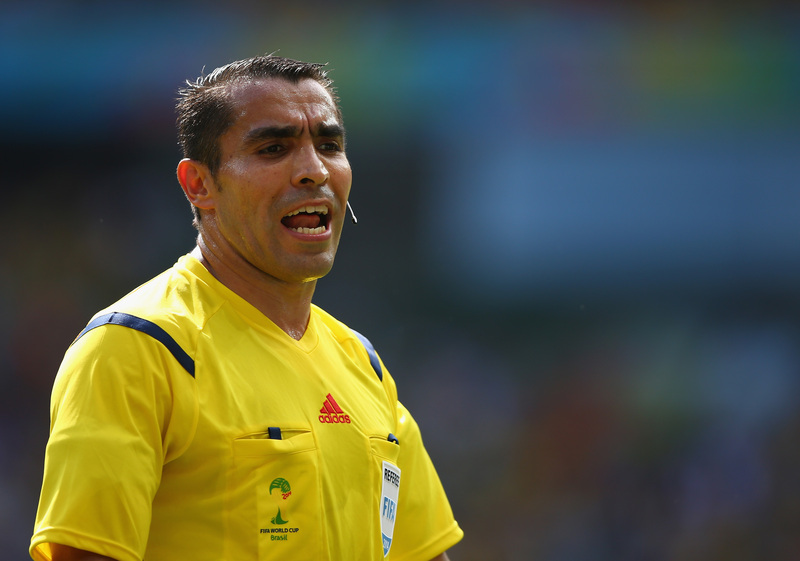 The 40-year-old referee made his first international referee appearance during a March 1999 game between Paraguay and Guatemala. While Rodriguez may have missed the Suarez biting incident a few weeks ago, he did hand out his first and only red card during the same match-up, kicking Italy's Claudio Marchisio out of the game. Rodriguez does have a history of dishing out cards. His track record includes kicking 51 players out of 79 international games prior to this year's World Cup games. The only other game Rodriguez officiated so far during these festivities was the Belgium-Algeria match-up where Belguim came out on top, 2-1. After Rodriguez was announced for the Germany-Brazil game, Germany manager Joachim Löw is insisting that Rodriguez come down hard on any overly aggressive behavior from any players, particularly from the Brazil team, during the semifinal match-up. This statement came on the heels of what Löw called "brutal and crude" tactics during the quarter final game between Brazil and Colombia, which resulted in Neymar, Brazil's best player, injuring his back after being kneed by one of the Colombia players. Rodriguez needs to keep a lid on his upcoming assignment by setting the tone early. He must continue to be firm, although less so than offering one red card every two games, by ensuring players know they cannot get away with rough treatment. That guy with the whistle who takes charge of the match must enforce every single law of the game. They even have pre-game responsibilities, including the role of ensuring the safety of the playing field (for instance, no large rocks on the field), and confirming that all corner flags and pylons are placed properly. They’re pre-game duties don’t stop there, though — they must be present for the coin toss and then make sure that the game starts on time, no exceptions. This can certainly be a tiring job once the game gets started. Constantly running up and down the field (nearly, if not more, than the players do), these officials must locate themselves where they can see the action first-hand in order to assess to situation and determine any violations. These guys are always on the lookout and always on the run; after all, it is their duty to stop the game if a penalty or injury is perceived. This is a huge stage for Rodriguez, and his job is far from easy. Yes, he missed one major incident in the Uruguay-Italy game, but this is his biggest game of his career. No doubt he wants to referee a fair game.